Toshiba Medical Systems Europe introduced a next-generation 80-row multi-slice computed tomography (CT) scanner at the annual U.K. Radiological Congress held this month in Manchester. 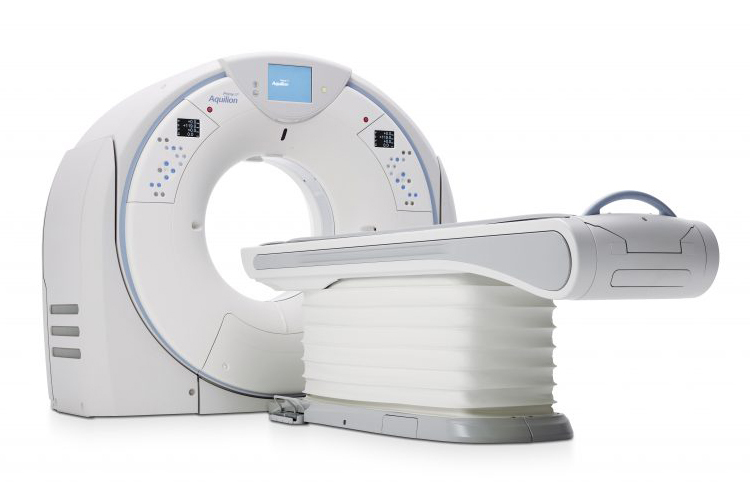 The Aquilion Prime SP incorporates major improvements in functionality, imaging performance and clinical applications to its Aquilion PRIME CT scanner. With the Aquilion Prime SP, examinations can be performed at lower exposure and iodine doses while acquiring high-resolution images with PUREVision™ Optics. PUREVision provides significantly improved imaging efficiency from photon generation to detection and by making up to 40% more efficient use of X-rays. The PUREVision detector allows clinicians to minimize patient dose while improving quality. The new system also enables automated kV selection based on a patient’s size and the clinical task selected. This function, a part of Toshiba Medical’s SUREExposure™ technology helps optimize the use of iodine contrast media. Aquilion Prime SP features a new 3-phase Variable Helical Parameters, allowing a change in imaging parameters and table speed within the same exam. By combining up to three protocols into a single scan optimizes the use of contrast media and can help reduce patient dose and motion artifacts. Aquilion Prime SP utilizes Adaptive Diagnostic solutions software designed to make complex exams faster while improving diagnostic precision and reproducibility. Dose-neutral metal artifact reduction technology SEMAR™ (Singe Energy Metal Artifact Reduction) utilizes a sophisticated implant. Dual Energy helps identify calcifications and iodine maps and virtual non-contrast images improve lesion detecability. Toshiba Medical’s proprietary iodine mapping technology clearly depicts perfusion at low dose and iodine levels. Toshiba launches 80-row CT scanner at UK radiology society meeting. Appl Radiol.